This weed grows in plains of India in late winters and blooms in spring with purple or creamish white flowers. 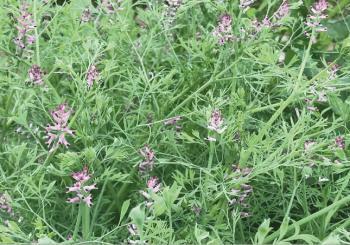 It is quite common to find this plant growing in the fields of wheat, barley, oats, alfa alfa, mustard, chick pea etc. In India it is harvested/collected at the end of spring season and marketed. It belongs to family Papaveracae genus Fumaria with around sixty species growing in Europe, Asia, Africa, Australia and few other countries as a weed. It is an annual plant with week erect stem, thin smoky green leaves. Flowers, depending upon the species are of purple, creamish white, creamish with purple tips. Fruits of the plant are tiny rounded with single seed. Ayurvedic name of the plant is Parpat or Pitpapra. In some countries, it is called Fumria or smoke on earth. Health benefits of the plant have been described in classical Ayurvedic books Charak samhita, Sushrat Samhita & Bhavprakash Nighantu. Whole plant and its extract are used in various formulations .Scientists have found few alkaloids in it having great therapeutic values. Detailed health benefits of it can be studied under following headings. Free radicals are chemicals produced in our body which have an unpaired electrically negatively charged particles called electrons which react with healthy cells of our body and damage them. Most of the degenerative and age related diseases are caused due to deleterious free radical reaction with body. Some of these diseases include atherosclerosis i.e narrowing of arteries due to deposition of fatty material called plaque which cause deadly heart and brain stroke, inflammatory diseases of joints like knee joints, elbow joint, shoulders & cervical joints, and many other diseases like kidney failure, diabetes, asthma, cancer, dementia, eye diseases, thyroid & liver diseases. There is hardly any non communicable disease in our body which has no relation with free radicals. These free radicals are produced in our body due to stress, unhealthy food, smoking, alcohol, pesticides, preservatives, radiations, sedentary life style, disturbed bioclock etc. Fortunately there are many herbs, natural foods, vitamins, nutraceuticals, trace elements, minerals which have free radical neutralising or scvanging effect to protect our body. These are called antioxidants. Pitpapra is a precious herb which has lot of antioxidants and few phytochemicals [phyto means plant based] with great health benefits to manage above mentioned diseases. Liver is the largest gland and organ of human body to detoxify it from chemicals and help metabolism in the body. It produces blood clotting factors, proteins, triglycerides, cholesterols, stores glycogen which provides energy produces biles for digestion of fats in food. Pitpapra is a wonder herb for healthy functioning of liver. Due to unhealthy eating habits and intake of alcohol, there is development of disease called fatty liver. This herb when taken regularly in the form of fresh juice of 20 grams herb or decoction of 10 grams of dry herb helps in recovery from fatty liver. In inflammation and enlargement of liver which is called hepatitis in medical terminology in which during blood tests we find SGOT, SGPT and Bilirubin levels raised, use of this herb recovers the condition. It has been seen that because of unhealthy foods and sedentary life style, cholesterol levels go high which are responsible for heart and brain stroke. Use of this herb keeps blood cholesterol levels low and can prevent this disease. In case if a person has suffered from heart attack or brain stroke or has undergone by-pass surgery or stent has been put in arteries, use of pitpapra can prevent another heart attack and brain stroke. Hyper acidity, indigestion, gastritis, constipation, colic are some of the common digestive disorders these days. Intake of this herb under medical advice relieves these problems significantly. In ayurveda, most of the non communicable skin diseases are considered as due to vitiated Pitta dosha or incompatible foods, producing toxins. Pitpapra is quite useful in skin disorders like eczema, psoriasis, itching and urticaria. In Ayurveda, one of the property of Pitpapra has been highlighted as Jwar ghan where jwar means fever and ghan means suppressant, so jwar ghan means which suppresses fever. Decoction of Pitpapra is recommended in common fevers by Ayurvedic physicians. Scientists have found that this herb has properties of killing germs or bacteria which cause common fevers. We find that most of the diseases in body start with inflammation as first step of the disease. In case of inflammation of joints, it is called inflammatory joints disease or arthritis and if it starts in arteries of heart or brain, it is beginning of narrowing of arteries of heart or brain which causes heart or brain stroke. Further, if it is in stomach, it causes ulcers. Pitpapra or Funaria is nature's gift to man which if used regularly as a preventive measure, can help in the prevention of most of the inflammatory diseases. It has been observed that Pitpapra has useful effect of managing some of neuro muscular disorders like parkinsonism, myasthenia gravis, dementia, memory problems, low motivation, arousal etc. In Ayurveda, various health benefits of this herbs have been described thousands of year ago and these days scientists have also observed many health benefits described above and few more health benefits like increasing fertility in men, killing intestinal worms, dilation of bronchi of lungs and helping asthmatics. So, we find that mother nature is kind enough to provide various herbs which can prevent and cure most of lifestyle diseases which are increasing at alarming rate. Only we need to have information about health benefits of herbs described in India’s native wisdom in health and medicine i.e. Ayurveda - the Vedic science of life. Charak Samhita, the most authentic classical book on Ayurvda, has an important quote “There is no plant on this earth which has no health benefit”. This quote proves true for a weed Pitpapra, botanically called Funaria indica which is considered as a nuisance by farming community and is destroyed using weedicides because innocent farmers do not know its medicinal value.